When Caroline and Anthony Borgman decided to return home to England in 2007 after living in Dublin for many years, they chose to settle in Oxfordshire. Ready to start a family, they were looking forward to having friends and relatives close by. 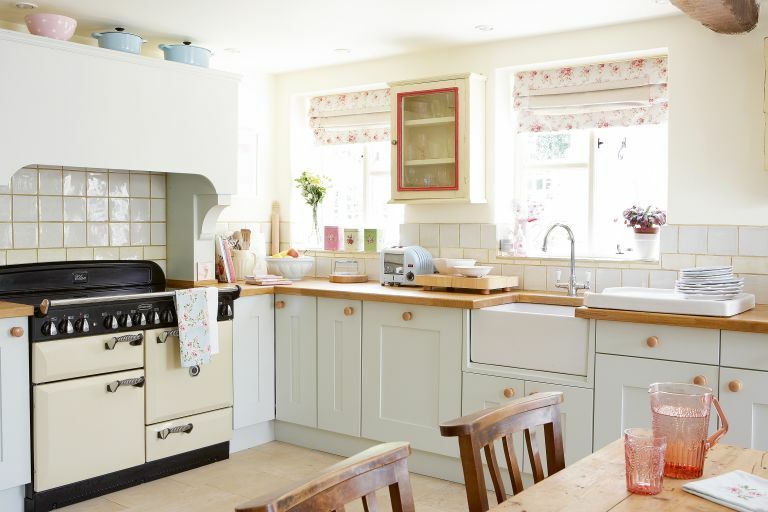 They eventually found their ideal property in the form of this Cotswold stone cottage, which came with a large garden that they knew their daughter Amelie May would enjoy. Caroline, who works in fashion, had quite firm ideas about how she wanted their home to look; she wasted no time in gathering plenty of material from local contacts, finding a rich source of talented craftsmen and interesting shops. But before the house could be revamped, Anthony – who’s an insurance consultant – was keen to tackle the substantial list of structural problems first; to try to keep the renovation costs down, they were both prepared to do much of the work themselves and learn many new skills. What impressed our judges most was that the Borgmans have created an interior with warmth and personality while also respecting the character of the stone structure; it was no surprise that this entry was voted Best Cottage in our Readers’ Awards 2010. Anthony explains: ‘Our cottage was built in 1860 with just two bedrooms and two small reception rooms downstairs. The people we bought the house from had done a lot of work on it during the 1990s to double the size: they extended it massively to create a spacious dining area in the entrance hall, a decent sized kitchen and a conservatory, while adding two further bedrooms upstairs. ‘The first thing I needed to do when we moved in,’ he continues, ‘was to tie the external walls of the conservatory extension; for some reason that hadn’t been done and it’s essential to ensure the building stays watertight.’ Since this important job had been missed, the house had suffered from damp, so Anthony had to make all the walls sound, then add a fresh coat of render outside, and plaster the stripped walls inside; at the same time, he covered the red-brick chimney breast in the sitting room – which was clashing with the exposed natural stone in the alcoves – and had the wood-burning stove reconditioned. He was then able to get to work on the bathroom. Caroline had already sourced an inexpensive roll-top bath, toilet and vanity unit online – so with a little help from a professional, Anthony updated the plumbing, making sure that unsightly pipes were all channelled below floor level; he also designed and fitted the walk-in shower, hiding its piping behind a stud wall. Similarly, in the utility room, he created a unit to accommodate the washing machine and tumble dryer, and raised the appliances on a plinth to disguise their workings. He also made radiator covers with lattice fronts for the whole house. Anthony put his newly acquired carpentry skills to use in the kitchen, too. After having bespoke base cabinets made, he built individual wall cupboards from off-cuts of wood; Caroline then gave them a distressed paint effect. He also constructed the cover for the extractor fan to complement the Shaker-style units, which Caroline also finished off beautifully. When it came to the lighting, they wanted to make it more streamlined. Caroline explains: ‘The ceilings are quite low downstairs, so Anthony installed spotlights in the kitchen and dining room. Then we chose some attractive natural carpets to replace the old dark ones: cream wool for the sitting room and the two newer bedrooms, and hard-wearing sisal for the stairs and upstairs hall.’ In the kitchen, dining area and bathroom, they opted for simple limestone tiles to keep these rooms feeling light, bright and practical; meanwhile, the two oldest bedrooms benefit from the original floorboards being exposed. To put back some of the character that had been lost during the 1990s renovation, the Borgmans then hunted for antique pine doors in reclamation yards; these are more in keeping than the modern pine ones they replaced; at the same time, they had a stable door fitted on the side of the house for a country feel. While she has enjoyed the whole renovation process, accessorising their home was what Caroline looked forward to most, and everywhere you look there are interesting little details: butterfly hair decorations clipped on to Amelie May’s curtains; vintage bottles in the bathroom; twig heart wreaths, quirky signs, and lampshades that look like pretty hats. After all the hard work, the house looks beautiful and has given Caroline and Anthony the family home they’d dreamed of – but it’s not just the house that has been transformed. ‘The learning curve has been steep,’ says Anthony, who has become a designer, labourer and craftsman. ‘I’m keeping my workshop and I’ll carry on making toys and furniture for Amelie May and other children we know; and maybe one day I’ll even be able to give up the insurance work and be a carpenter full time. And possibly in partnership with Caroline – she could easily transfer her skills from fashion to interior design.’ Until then, though, they can both feel satisfied that they’ve brought out individual character in their old home.